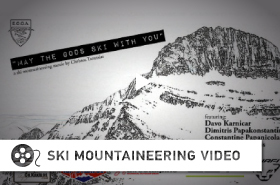 Mount Olympus comprises one of the most popular albeit interesting ski mountaineering destinations within the Greek territory. 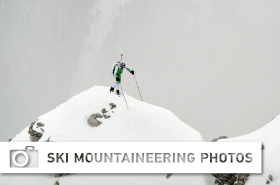 Ski mountaineering began taking place on the slopes of Mount Olympus during the 1930's when many alpinists were using skis for approaching the higher peaks. During the post WWII era downhill ski races were taking place on the western side of the mountain where gentle slopes and the existence of the military camp at an elevation of almost 2000m, provided an adequate infrastructure for such events. Today Mount Olympus comprises a world class destination due to its proximity to the sea, the variable relief (easy terrain on the west part of the mountain, steep slopes and narrow coloirs on the east and north sides), the long descents (1000 - 2000m in elevation drop depending on the snow cover) and the long season as skiing starts in early December and can last until the beginning of June.